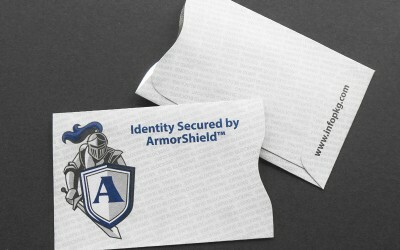 ArmorShield® RFID Blocking Card Sleeves - Choose from our 5 or 10 packs! Your identity will be secured when you use our Tyvek and alloy based ArmorShield® RFID Blocking Card Sleeves. Choose from our personal sized 5 or 10 packs. These long lasting, protective card sleeves prevent would-be thieves from skimming your card information for fraudulent purposes. The logoed sleeves measure 2 1/4″ x 3 1/2″ and have a standard thumb cut for easy access to your card.